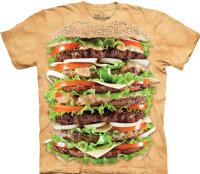 Epic Burger T-shirt from The Mountain® will have your taste buds going crazy. Get your lips around this burger! If you are looking for the perfect bbq or picnic t-shirt or if you just have a love of the All American beef hamburger than Epic Burger is the t-shirt for you. The Whopper, the Big Mac have nothing on this hamburger of epic proportions! Screen printed image that won't crack or peel. 100% pre-washed, pre-shrunk cotton, hand-dyed using water based inks.